For any time you need them! 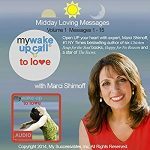 Refresh your senses with this series of daily five-minute love messages with happiness expert Marci Shimoff. My Wake UP Call to Love™ is part of a series of patented inspiring, motivating messages invented by former longtime Broadway star, Robin Boudreau Palmer. My Wake UP Call® Motivational Alarm Clock® Messages and My Good Night Messages™ are uniquely-structured morning and evening five-minute messages with renowned experts and thought leaders who bookend every day with inspiration to achieve your personal goals and dreams, instead of with blaring buzzers and negative news. And now you can get inspired anytime, anywhere with My Wake UP Call® Motivating Messages and My Wake UP Call® Daily Inspirations! Messages can also be automated to play with free, playlist-playing alarm apps at the Apple Store, Google Play, or with a list of recommended apps. Featured in Shape, Self, USA Today, Fox, and NBC TV and Robin’s TEDx Talk, “The Most Important Minutes of Your Day”. Motivational Alarm: “Motivational Messages Plus Alarm, Not Restricted to Wake Up”. 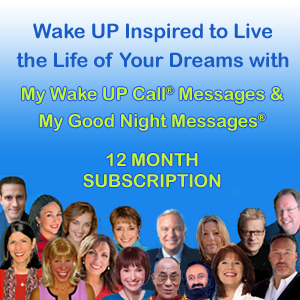 My Wake UP Call®, My Wake UP Calls®, and Motivational Alarm Clock® are three of eight registered trademarks of My Successables™ Inc. ©2014 My Successables™ Inc. All messages and message formats are copywritten. All Rights Reserved.